Finally I am back with another update on my Project 10 which I had embarked on late last year. This time round, it is focused on the blushes that I've kept. This category was more difficult than bronzers and contouring powders, because I use blush on a daily basis. So let's dive straight into my 10 single blushes that I've kept after the purge. I rarely hear Makeup Store being talked about but their cheek products are really nice to work with! I had 4 blushes from that and I did enjoy the run while it lasted. I gave the other 3 away and kept the shade Sugarpink. However, at the time I am typing this, I googled and realised that this is a discontinued shade! This is a neutral pink that adds a lovely light flush to the cheeks. I enjoy the formulation of these, as they are soft and finely milled, so working with them is a breeze. This is the only NARS blush that I kept as I found the shade really unique. This is a gorgeous berry shade and since I kept many pinks, this would give me a wider range of options. 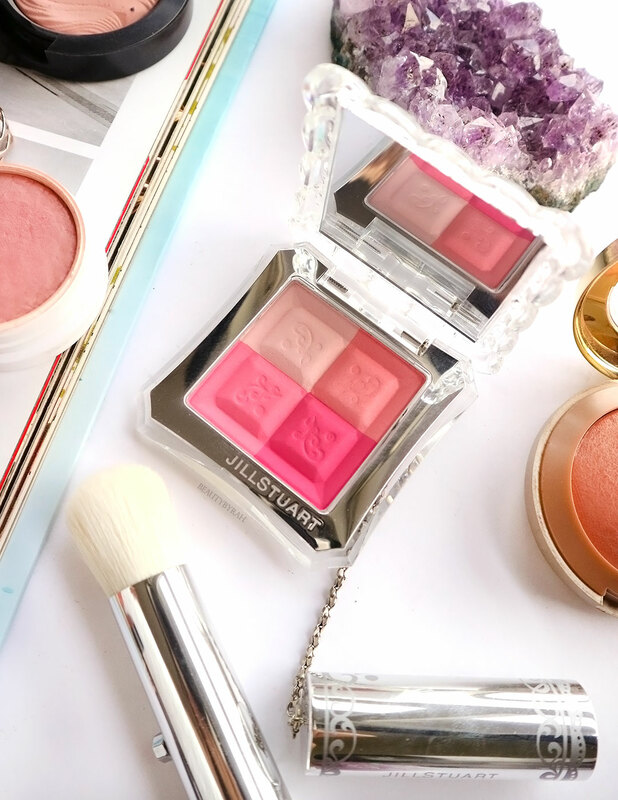 With a light hand, this blush looks lovely on! I find it to lean slightly towards a cooler tone, and it looks better when I am fairer. 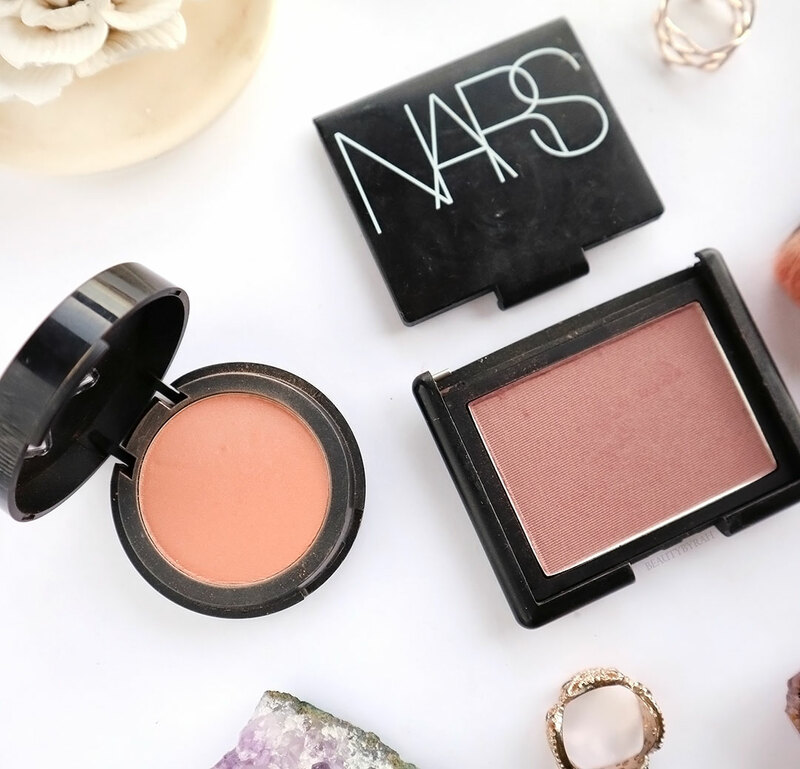 I do enjoy NARS blushes, but they are extremely pigmented! This can be a pro and con, but now, I generally prefer the ability to slowly build up the colour intensity than a one stroke application. I can be quite heavy handed, and I usually finding myself always having to further blend out the blush with a powder brush or my beauty blender. As you can see from the next 3 blushes, I love me my MAC blushes. My first ever blush was from MAC and it was Warm Soul since it was so hyped up that time. But Warm Soul is the perfect blush. 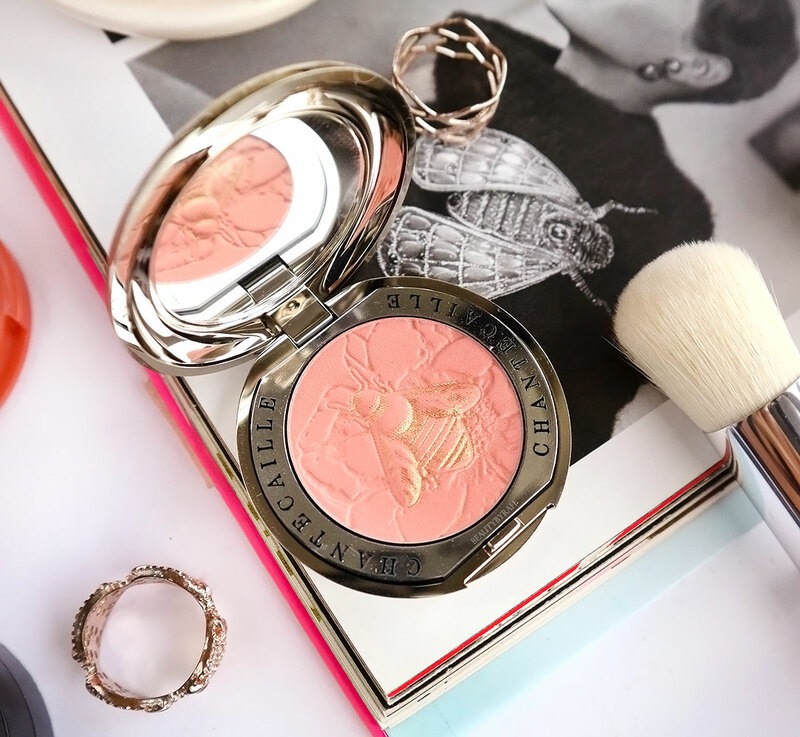 If I could only choose one blush to repurchase throughout my entire life, it'd be this. It is the epitome of a natural flush to the cheeks for me. 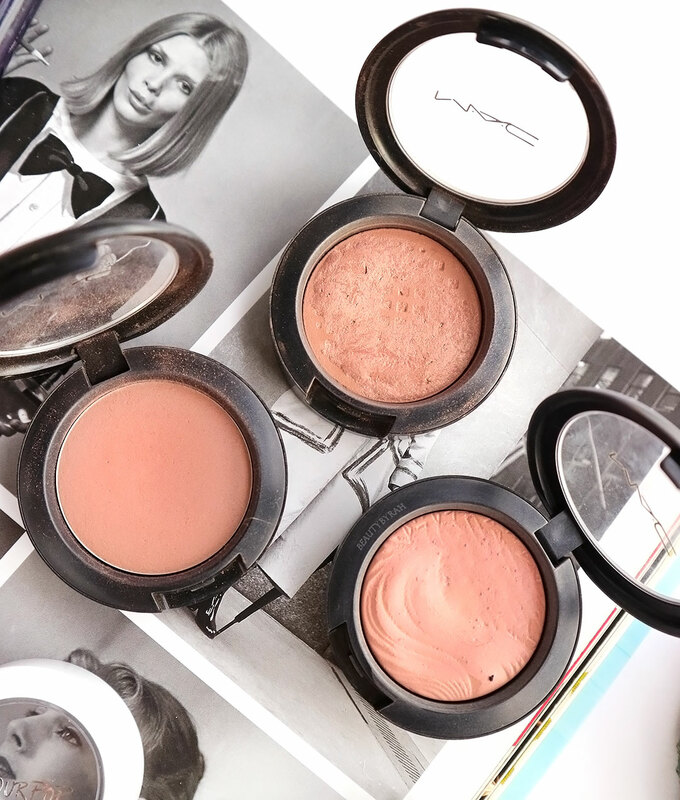 You can see from the image above that this blush (middle/top) has been very well loved. This is another favourite shade of mine (left in the image). This is a neutral pink with a luminous finish, and since it not as warm as my other shades, I love this for when I am slightly fairer. I also find that the Pro Longwear formula does last longer on my cheeks than the mineralise and extra dimension range. I love the extra dimension range from MAC! It gives the skin such a lovely glow and radiance. This blush is a warm pink, and while it takes a bit more effort to build up to the pigmentation that I desire, I love the effect it gives my cheeks. They look flushed and healthy. Colourpop's formulation just knocks it out of the ball park. It is so easy to apply! I just simply dip my fingers in and apply it to the apples of my cheeks. Not the most sanitary, I know, but for a quick, fuss-free application, this is amazing. If I am feeling fancy that day, I'll even chuck this into my gym makeup bag, so I can add a lil flush to the cheeks after showering. Birthday suit is a gorgeous neutral pink with multi-coloured shimmer in it. The shimmers are barely noticeable when applied, so it just adds some lovely glow to the cheeks. I feel like this is the more affordable version of my absolute fave, MAC warm soul. 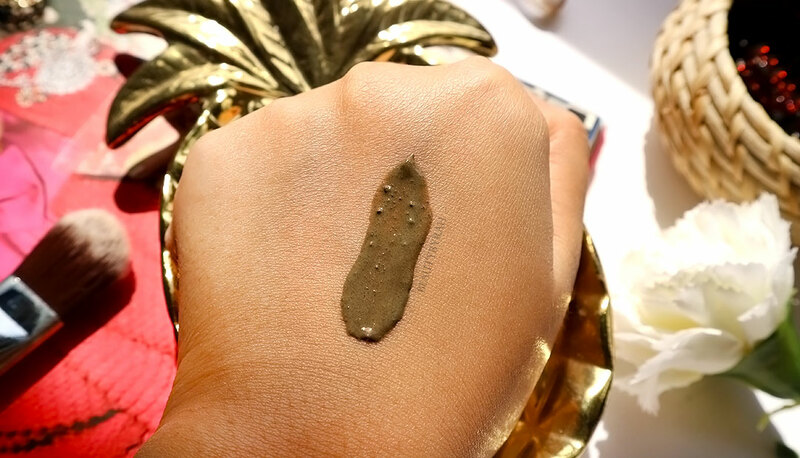 This has a stronger sheen to it, and with a heavy swatch, Warm Soul does look a tad warmer and peachier (you can see comparison swatches here) However, with a light hand and when they are applied to the cheeks, I personally feel that they are pretty comparable. This baked blush is great for adding a little glow to the cheeks, and sometimes I would even skip highlighter when I use this. 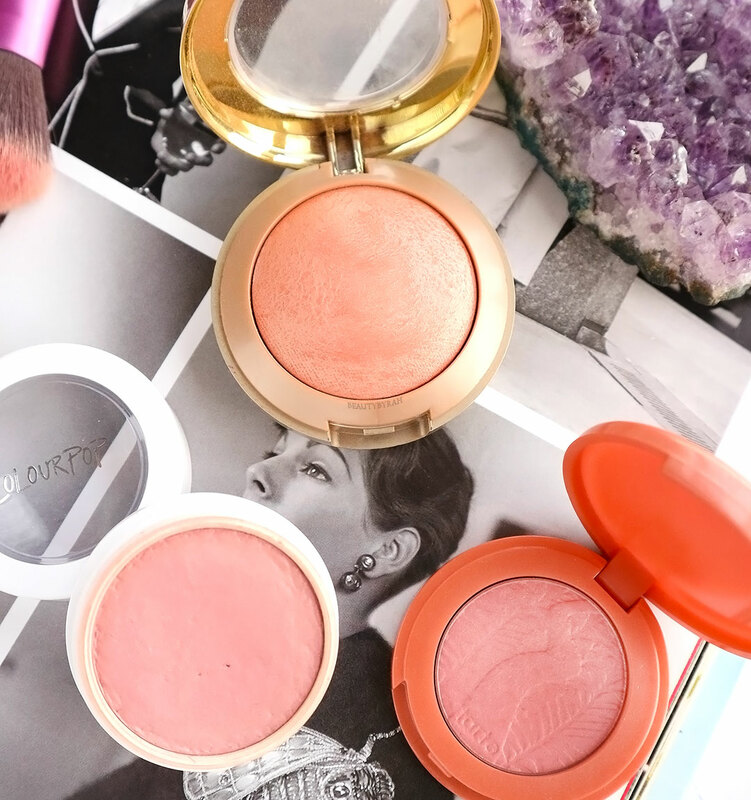 Tarte's blushes are one of the longest lasting blushes out there in the market and the shade Peaceful is my ultimate favourite. I love to bring this travel sized one on my travels as it lasts all day, despite my sweat and grim. This is a soft peach that work really well when I am fairer, and when I get tanned. It isn't too pigmented on the first swipe, which I enjoy, as that means I can slowly build it up to the intensity that I want. Trust me, these are so long lasting, you don't want too much pigment on the first swipe as it would be extremely difficult to remove or blend it away! Honestly, I kept this because I paid so much for it! Haha. But it is extremely compact, making it great for travelling. Chantecaille also have lovely designs embossed on their blushes, so the shade emotion has a bee. It works nicely to give a flush to the cheeks, but I personally am not overly impressed with the pigmentation or formulation, especially considering the hefty price tag. The packaging on this got me, for sure. Jill Stuart Beauty has such lovely packing and I can't give this away. The blush itself works well too, and it is the only cool toned pink that I kept. I like that I could focus my brush on a the individual squares or mix them up for a slightly different shade. It has a satin finish and it looks great on bare skin and with minimal makeup. There we have it - my 10 single blushes that are left in the my collection! I do enjoy the variety of shades and finishes that I can choose from, and I've been switching it up almost daily. Hope you enjoyed this little read and I will be posting about my highlighters that survived the Project 10 next. Man, highlighters were so tough to purge. 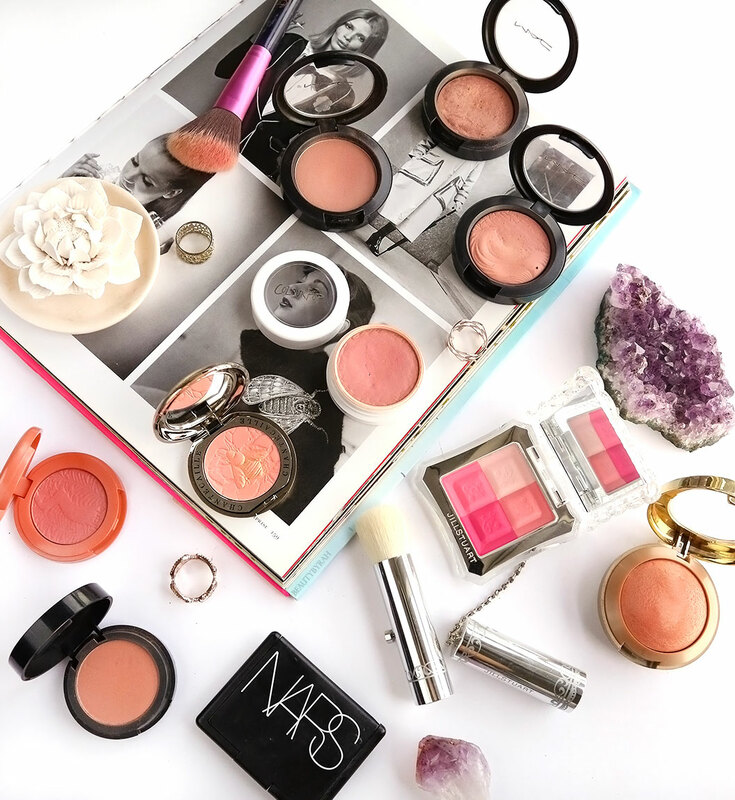 What are some of your must have blushes? 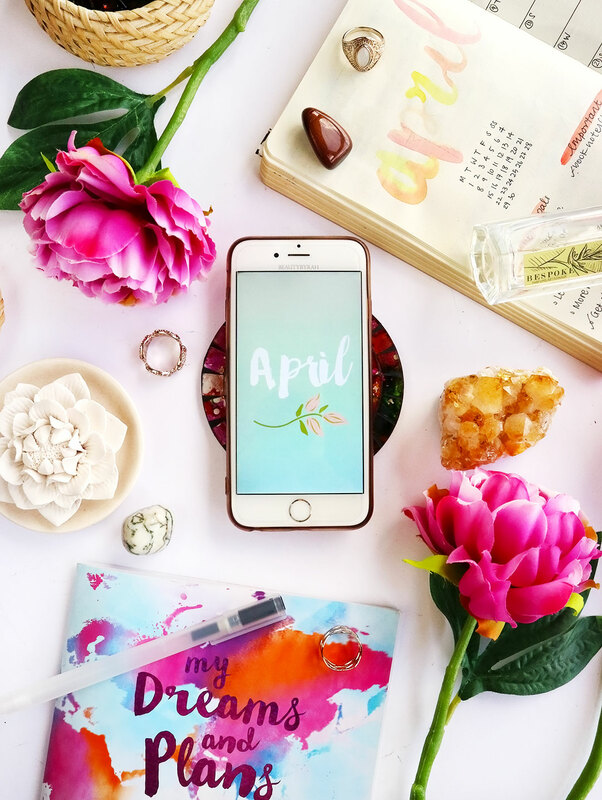 April is here, which marks the beginning of the second quarter of the year. I almost typed new year because it still feels pretty new to me, despite the fact that 3 whopping months have already past! When I told my friends on April 1 about how it was the beginning the second quarter of the year, they giggled and reminded me that it sounded like financial quarters! That's true. But thinking this way definitely has some benefits. Firstly, think of it as a new start. I had some new years resolutions that I did not really carry through in the first 3 months, so this is a new beginning and I'm determined to start it right again. We sometimes always need a starting point to begin something, that is why New Year's Day is so significant. However, when you think in terms of yearly quarters, you kinda get that same "fresh" starting point three times a year. So there really isn't any excuse to drag it out and wait till the next year starts rolling around. It also gives us a little push to think about the past 3 months and how we had spent it. What went well? What was I proud of doing? What can I improve on? Self reflection is very important to me, as I want to aware of my own journey and see what I'm actually doing on a regular basis. I used to be the type of person who would be shell-shocked when the end of the year rolls by and I would question myself what in the world I was doing. Not anymore though. With quarterly and monthly reflections, I am taking control of my actions and taking up responsibility for whatever happens in my life. So I did some reflection end March and I thought about 7 different categories to see what I had achieved so far and what I would like to achieve in the next few months. If you're interested, the 7 categories I used for my reflection are: Physical, Intellectual, Emotional, Social, Spiritual, Financial and Environmental. After taking a look at my future plans, I've listed some goals for the upcoming second quarter of the year. Hopefully, this inspires you someway. If not, it's for me to also put it out there so that I can hold myself accountable. I hope to start properly strength training and learning the proper forms. I've been lifting a few weights here and there but that really isn't anywhere close to what it should be. I am generally afraid of injuring myself with the wrong form so I do plan to get into a programme or find a personal trainer for a while. I am strong and I would love to transform my body as being someone who has been overweight for most part of her life, I think I'm done with feeling uncomfortable with my body. While the goal of a leaner physique is important, I think that whole process of going through the exercises and increasing the weights over time is way more important to me. I hated exercising when I was younger so for me to personally push myself and see myself working out in a way that I never thought I could, that's pretty amazing. One of my 27 before 27 goals is to be able to converse in basic French. I have to really persevere with this and just keep going. To be even more specific, I plan to watch a French video of at least 15 minutes every Thursday. I know one video a week isn't much, but it's a good starting point for me as I've been always wanting to do it but never really set a specific routine that I implement. With a set routine of Thursdays, I hope to learn more vocabulary and with the audio in the videos, hopefully I'll be able to understand more words too. Slow and steady steps! I've always been interested in expanding my investment portfolio and I do want to learn more about SRIs. I think that another simple thing any individual can do, besides switching to environmental friendly products, is to help in anyway possible in the development of environmental friendly companies. I've been looking into to clean energy and other funds, hoping to find something that resonates with me. Recently, I got myself a Philips Viva Collection Pressure Cooker and boy, has it changed my meal preps! I love that I can just dump things in, close the lid and let it work its magic for a few minutes and viola, I have a healthy meal ready for me. I've been playing around with healthy recipes lately as I do want to become healthier. I realised that my tendency to always opt for fried and processed foods is not doing my body any good and I want to make a change. With the pressure cooker, cooking chicken breasts have never been easier (and it is so much juicer than baking it!) so my meal prep options are endless! I get excited to cook these days and I strive to cook healthier meals in the next few months. Electronics are not great for us, especially before bed time as it affects our sleep. I always knew this, but I somehow still find myself with the occasional opening of pinterest and instagram before bed. I plan to stop that, and I am going to aim for no electronics 30 mins before bed, and 30 minutes after I wake up. Sometimes, whatever pops up on our phones can change our mood and perspective for the day. Thus, I want to also start the day fresh and fully in control, before I deal with the necessary issues. So what are some of your goals for the upcoming month/quarter? 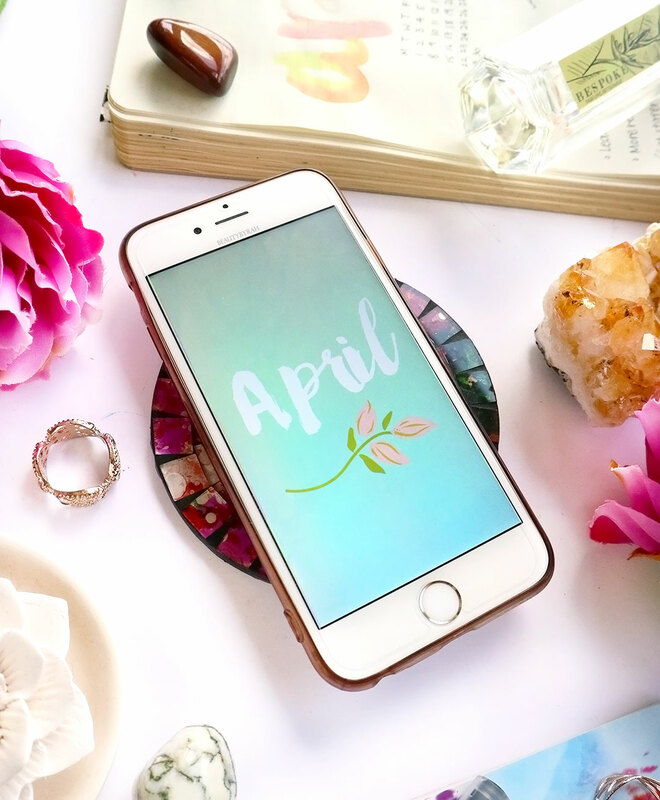 ** April wallpaper on my phone is from Dara Skolnick. 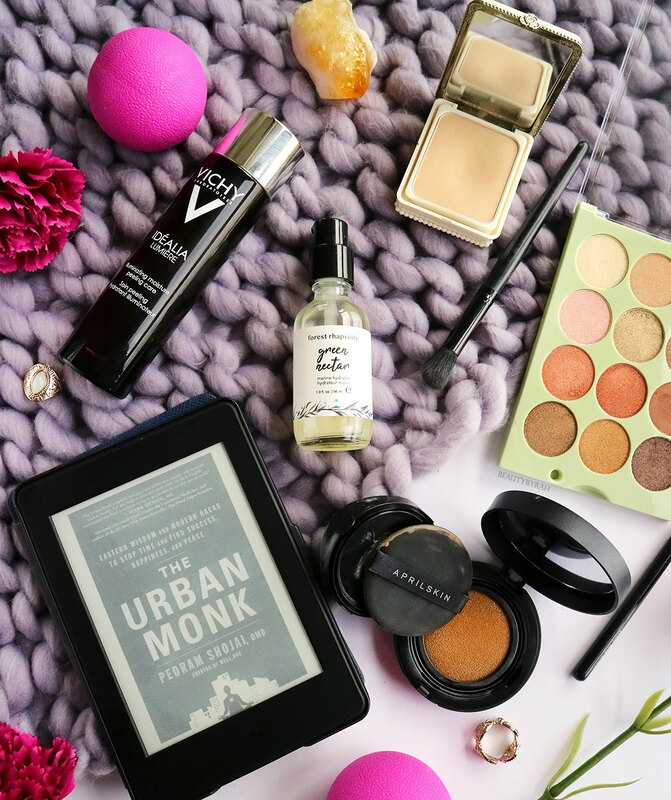 It's been a while since I've written a favourites post and that was mainly because I fell into a routine with my previous favourited items that I did not really experiment with others. However, I made a conscious decision to incorporate new products in the last month. my acne was much more manageable so I tried out more skincare goodies and after Project 10, I felt more excited to use my makeup products. As per usual, let's talk a little bit on skincare first. 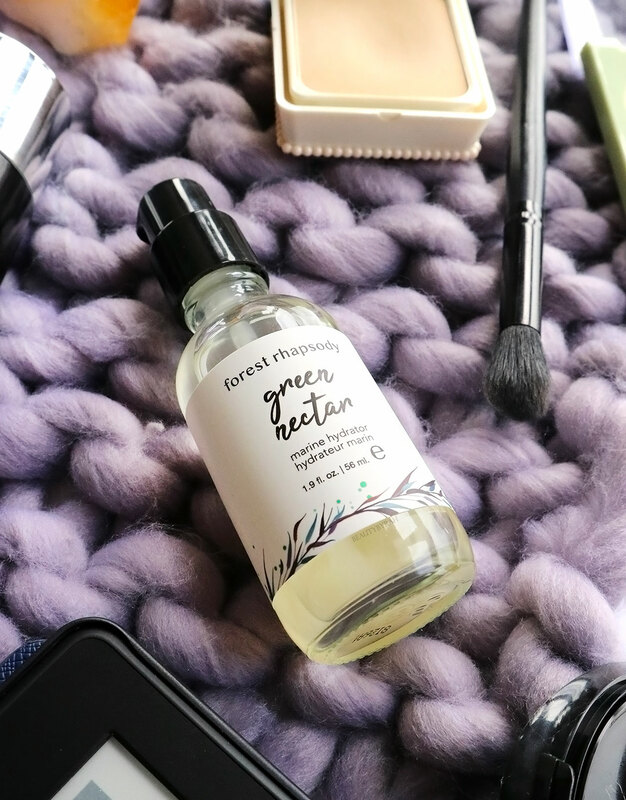 I recently received some items from Forest Rhapsody to try and while I have not managed to try all of the items out, I did particularly enjoy their Green Nectar Marine Hydrator Serum. This is a lightweight hydrating serum that incorporates the ingredients, green nectar, sea kelp, chlorella and healing plantain leaf extract and classic calendula flower extract to soothe and calm the skin while hydrating it thoroughly. 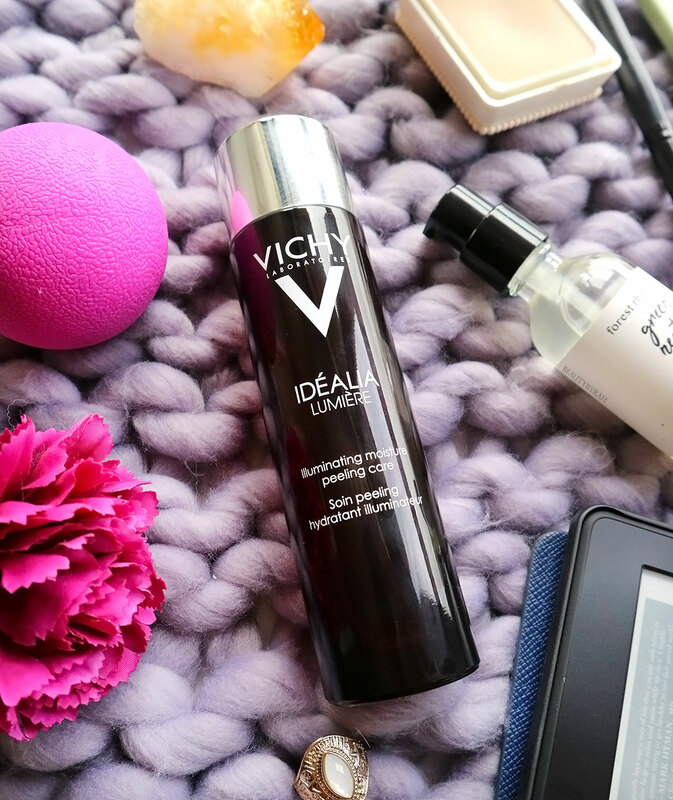 This serum is indeed really light weight and I find that it gets absorbed into my skin in seconds! It works well when layering with other serums too, making it an easy addition to my skincare routine. In terms of hydration, this serum does the job wonderfully. My skin recently became a little drier than normal (it could be the insanely hot weather recently or my diet) so adding this in helped tremendously. I did not notice any dry patches around the sides of my nose and my cheeks whenever I use this, and my skin also did not feel tight throughout the day. That said, I also think that this serum can work lovely as a makeup primer as it temporarily eradicates dryness while leaving the skin silky smooth. This serum can be bought on Forest Rhapsody's website or at Naiise stores country wide. Since I have finished my Loreal Revitalift Centella Microessence (I love it and featured it here and here) and my CosRX AHA solution, I decided to try this one out. This essence contains glycolic acid (an AHA which you know I'm all about) to help gently exfoliate the skin, and blueberry polyphenols and black tea extract which are meant to help improve the radiance and texture of the skin surface. I've been using this for about 3 weeks now and I do enjoy it as part of my night-time routine. It basically is a product that combined the 2 that I was using previously! The essence, as the name suggests, is very fluid and goes onto the skin with just a few taps. I like to use this right after I wash my face and before I apply my other serums and moisturiser. It is very lightweight and has no particular scent to it, so it is extremely easy to add it into my routine. 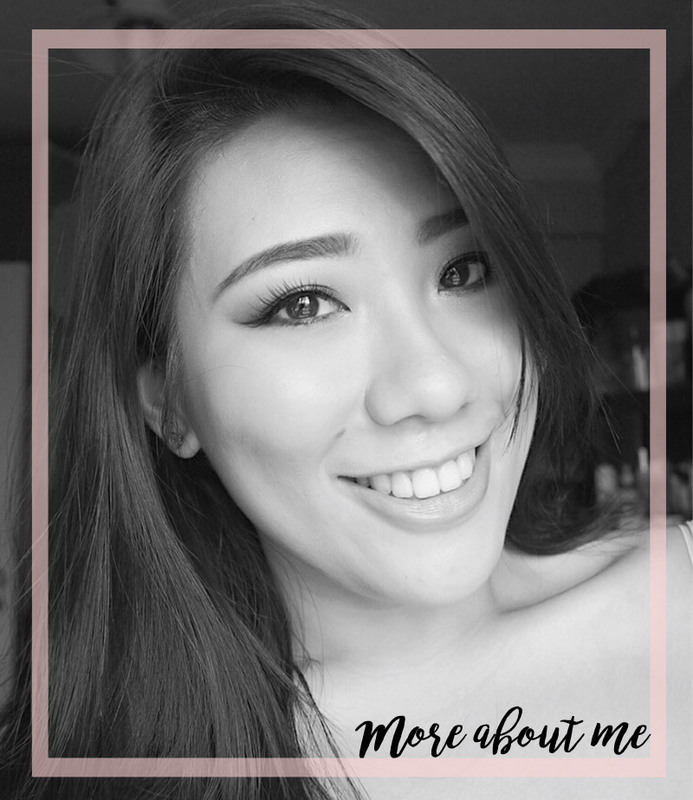 In terms of effects, I would say that it helped to maintain the glow on my skin that I've worked hard for through the use of all my chemical exfoliating products over the years. In terms of reducing dark spots and wrinkles, I can't really attest to it just yet as 3 weeks is pretty short time of a trial. Overall, I do think this is a great way to get into chemical exfoliation if you're new to it as it is extremely gentle while still getting the benefits of the other ingredients in the essence. Just at the beginning of last year, I still remember how I used to dislike cushion makeup and I never really saw the reason behind its popularity. Boy, I see the light now. It just boils down to personal preference and time that one is willing to allocate to doing their makeup. Before, I was all about foundation, concealer, brushes and all the works. Now, my makeup routine has been simplified dramatically, so I definitely see how cushion products like this April Skin Magic Snow Cushion is extremely useful. The coverage of this cushion is great and it helps to reduce the appearance of my red scars that are a result of my acne. Application is also extremely quick and with a few pats, this foundation is blended onto my skin perfectly. I actually rarely set my entire face with powder these days, but I find that this cushion foundation kind of sets on its own after a while. So usually I would apply this, then I'll move onto my eye makeup. Right after, I would apply concealer and set the concealer with powder. Lastly, I would sometimes use a little bit of powder blush and highlight over the cheeks and despite not setting the base, I did not notice any patchiness or streaks. Overall, this is one handy base makeup product and I do thoroughly enjoy it. However, there are only 3 shades and while I am already using the darkest shade in 23, it is still a little too light on my skin (I am roughly NC 25-30 now). I hope they expand their shade range! Since I had received this powder in the lightest shade a while ago in a PR event, it wasn't suitable to be used on the face so I thought to try it out for under the eyes. Man, I'm so glad that I did. 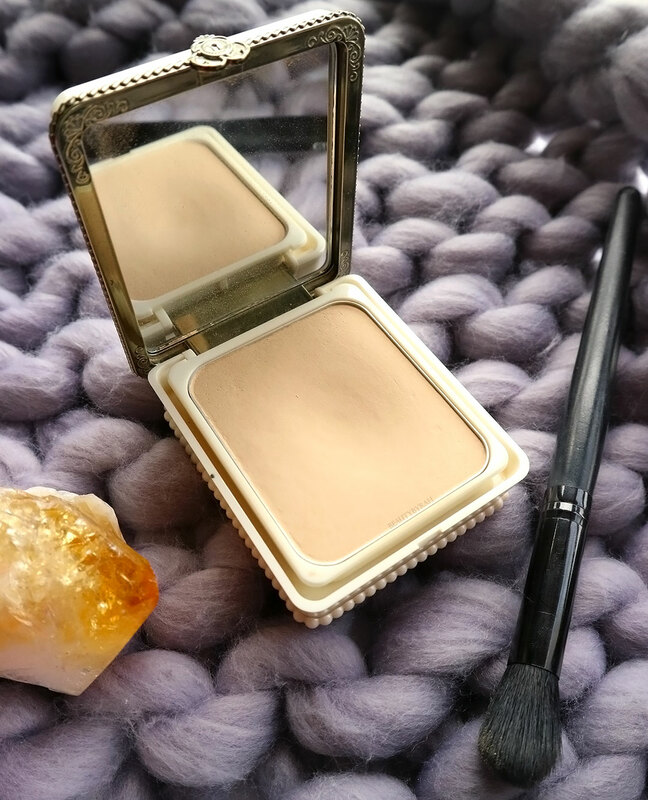 This powder foundation works really well in setting my undereye concealer and adding an additional layer of coverage for my dark circles. I've tried using powder foundation to set my concealer before, but usually that would make my undereye area really dry and emphasise the creases under the eyes. However, this powder foundation is very finely milled and when applied, my undereye area feels extremely smooth. It could be because it contains squalane, a moisturising ingredient that our skin also naturally produced by our bodies, but decreases over the years. The added coverage is great too, as it helps to further eliminate the darkness while adding more brightness. I haven't played around with a new eyeshadow palette in a long while! 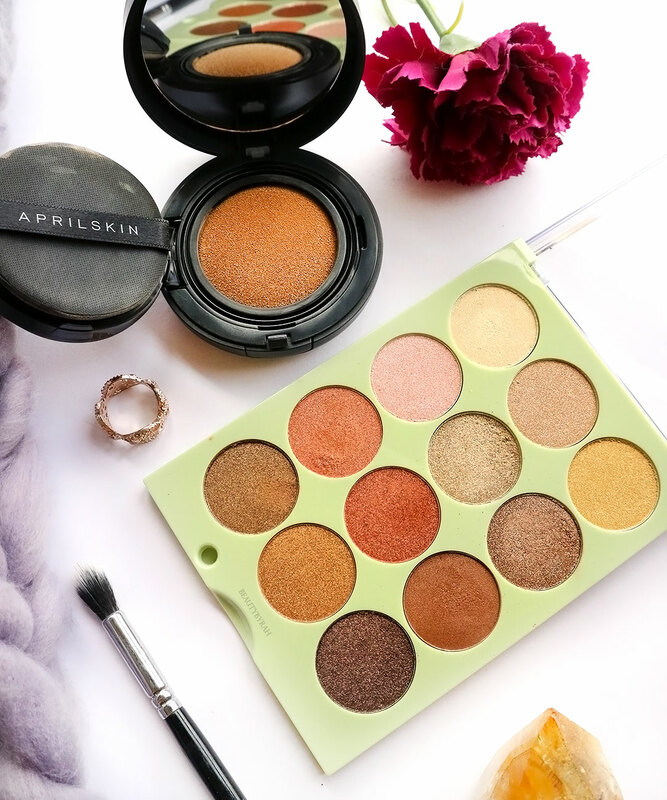 Recently, I was sent this Reflex Light Eye Reflection Shadow Palette from Pixi Beauty and while I was slightly hesitant at first as it contains all shimmer shades, I do really enjoy these as an all-over-the-lid shadows. My favourite shade from the palette has to be Brilliant Bronze (Second row, right side). It is the perfect bronze that works so well in smearing it all over the lid and working it gently into the crease. It adds enough oomph to my lids without being over the top. The shadows are great to work with, both with a brush and a finger. The formulation is lovely; the shadows feel creamy to the touch and pigmentation is decent. It isn't as pigmented as say, Urban Decay, but it is easy to work with and layer on. For me, personally, one swipe of the finger is enough pigment for me for my everyday makeup. I do still wish that there was at least one matte transition shade in here, but regardless, I do feel like this works well in offering options for shimmer shades. I know, this seems like a strange addition but I absolute love them! I tend to have really tight shoulders and my back usually feels quite uncomfortable if I strain it/carry heavy loads etc. I like to do some form of restorative yoga at night before bed and adding these lacrosse balls to roll out the back was a life changer. I tried out some myofascial release yoga in the past few months, and I loved how my body felt after. Thus, I decided to get my own lacrosse balls (or tennis balls, if you prefer) . Usually I can't get to the area in between my shoulder blades and since we should not foam roll out backs (due to our lumbar spine), this helps to ease the tension along my spine. I simply put these two balls along my spine and slowly roll them along. I also place them on my tighter areas and just lay there for a while to help the muscle and fascia release. These are pretty solid and I foresee them lasting a long time (previously, my tennis balls broke when I rolled on them haha). I got mine off Shopee for a really affordable price too. One of the easy to digest books that I've read recently. 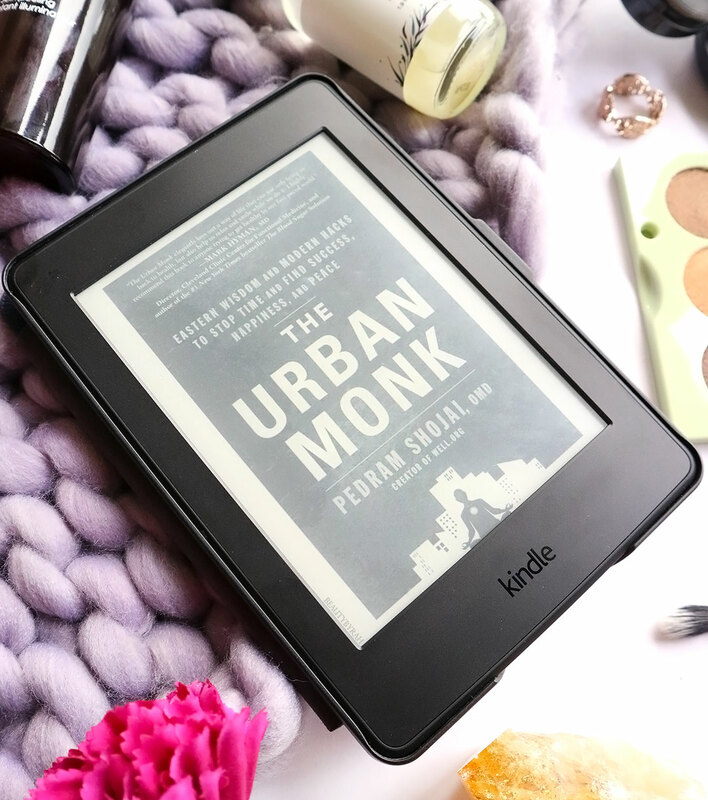 He breaks down why we face certain issues in modern life, such as lack of energy, stress and the feeling that there is never enough time and offers both eastern practices and modern day practices that can help with those issues. I find this book really relatable and while I am not familiar with eastern practices such as Qigong and herbs just yet, it is truly interesting to see how there are multiple viewpoints and solutions to everything in life. It is extremely easy to understand and it helped me to think of issues that I've never thought about before. One part of the book that really opened my eyes was a section about stress. He mentioned how in modern day life, we no longer face any immediate life dangers such as predators in the wild and that results in is our stress bucket not being calibrated regularly, causing us to be stressed by many small things in life. That definitely resounded with me and it also made me realise that the small things in my life should not warrant the amount of stress that I give it. I definitely recommend you picking this book up for a read! March really went by in a blink of an eye! Hopefully you had a good one! What are some of your current favourites? *PR/Gifted items. Only honest thoughts are shared here, with no influence from others. I am not compensated nor affiliated to the brand(s). So I think I am ready to put it out there. This is the best face mask I've tried in a very, very long time. Really. 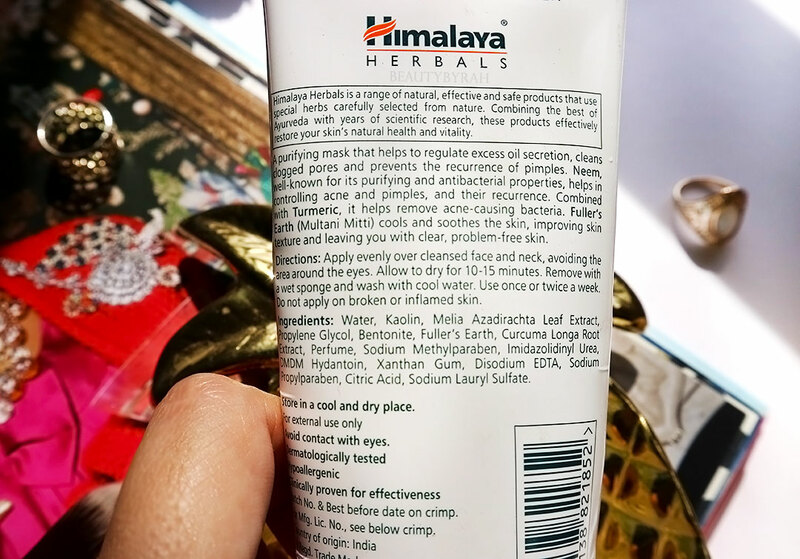 I mentioned this Himalaya Naturals Neem Face Pack or now known as Himalaya Purifying Neem Mask in my April Favourites last year, and since then, I've tried more face masks but I keep going back to this. There's just something about how this mask extracts impurities from the skin while not overly drying my skin out. This purifying face mask contains neem, fuller's earth and turmeric, which are great ingredients for the skin. Neem is known for preventing acne, curing acne scars and making the skin glow. Fuller earth helps treat oily skin, remove blackheads and whiteheads and reduce scars and lastly, turmeric has anti-inflammatory and anti-septic properties, which are great for people suffering with acne like myself. This mask claims to reduce excess oil secretion, clean clogged pores and prevent the recurrence of pimples, which I can attest to. I've been using this mask pretty often (about 1-2 times a week) for the past month, and I can see a difference when it comes to the blackheads on my nose as well as the acne on my cheeks. My acne seems to be much tamer and I get breakouts less often! I like that it comes in a squeeze tube instead of a jar as it is much more convenient and hassle-free.IT also doesn't dry out as compared to those in jars! I had my first tube for almost a year (that was before I rediscovered it and fell in love) and it worked perfectly. Just remember to give the tube a little shake before dispensing! The mask applies easily onto the skin as it has a slightly runny texture and it has a slight herbal scent to it. It's not that overpowering and I find that I hardly notice it after a minute or two once the mask starts to dry. Whenever I wash the mask off, my skin just feels purged without feeling tight. My skin honestly feels so clean (but not squeaky clean as that means all the moisture has been stripped!) and fresh. I love this after a workout especially, as it just cleans off all the gunk that has been trapped (and we all know how some gyms can get a little grubby!). 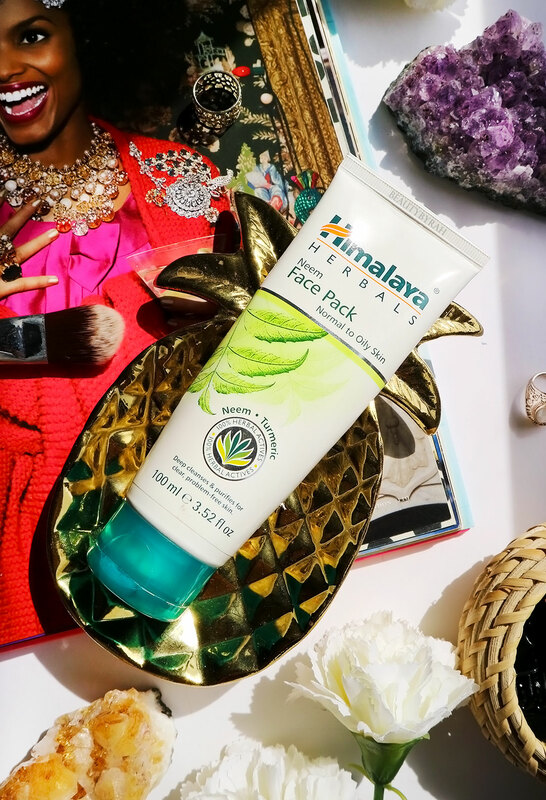 Overall, the little bumps around my cheek area was noticeably reduced and my pimples decreased in size with just a few uses so it is definitely a staple in my skincare routine. Best part is that it is extremely affordable! I always stock mine up from iHerb as it is much cheaper than in stores! It's about SGD 7.50 on iHerb while see it in Watsons for about SGD12. Even without the affordable price tag, I do think this is worthy of a place in your skincare routine and I hope that you will try it out! What is your favourite face mask? Give me some more options to try!